Stories of the Trickster – that archetype of backwards teaching – are some of the worlds’ most enduring tales. With Rabbit’s Song S.J. Tucker and Trudy Herring have given us a new chapter in his saga. Trickster, who has purple-blue hair – is looking for an animal to teach man, but he’s having a very hard time. Many animals are too scary, others are limited (like owls, who can only see at night). He eventually finds four: Raven, Rabbit, Crow, and Coyote who he sets specific tasks suitable for their natures to help man. The watercolor illustrations are typical wonderful W. Lyon Martin, complete with multiple ethnicities and the text’s insistence on ‘man’ there are women in the pictures as well. My only criticism is that the text does use ‘man’ to refer to both genders. I know that may feel like I’m making a mountain out of a molehill, but children learn what they hear and see and if they are taught that man is the universal word, we’re doing them a disservice. S.J. Tucker is a musician and performer with a large and devoted following. 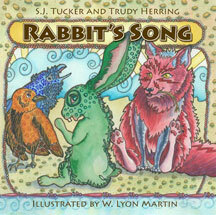 Her album Blessings has the original Rabbits Song, which was re-written for this book by Trudy Herring. This book is due out in February 2009 and is available for pre-order. As a special bonus, all preorders will be given an mp3 of SJ Tucker reading the story. Four rabbit tracks out of five.